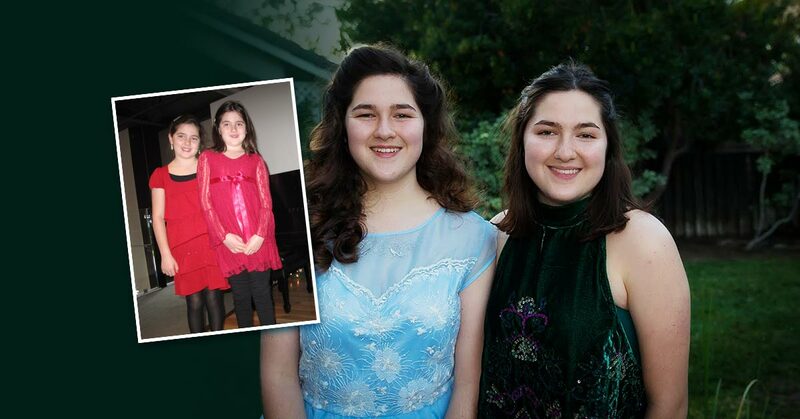 Twin sisters, Michelle and Nicole Smirnoff, have been attending Little School of Music since they were just six years old. Now, about to graduate from high school, they have grown into strong young women, ready to take on the world. The duo proudly shares how music has played such an integral part in their lives, teaching them discipline, confidence, friendship and teamwork; preparing them for their leap into college and beyond. How did your journey start at Little School of Music? Nicole: We started attending Little School of Music when we were six. Funny enough, we started because our parents were concerned about us sitting still in school and wanted to find a solitary activity that we enjoyed. We started in the Music for Little Mozarts Program and loved it. Miss Mindy made it so fun and engaging, combining songs with stories and stuffed animals and even treats. Michelle: We learned percussion instruments like maracas and triangles, learned rhythm through clapping, the keyboard, recorders, guitar, and even the glockenspiel! The Music for Little Mozarts Program is a gateway where you’re exposed to a lot of different aspects of music so that you can decide what instruments or specialties you really enjoy. It’s a great way to get exposure to all the different sides of music education. Nicole: After the Music for Little Mozarts Program, we began taking semi-private lessons with Miss Mindy, working within the Alfred level system. I loved the big white piano we played on. We also attended a group music theory class where we studied why we were playing the notes we were playing. Eventually, we switched to fully private classes with Miss Jean, studying more difficult music within the Music Teachers’ Association of California (MTAC) and The Royal Conservatory of Music Certificate Program (RCM) assessment programs. Michelle: Now, we are seventeen years old and starting our last year at Canyon High School. We are both members of Canyon’s marching band and wind ensemble. Nicole is also in the jazz program. We’ve both taken their AP Music Theory course and picked up playing more instruments. We now play the flute and Nicole plays the oboe. One of the best results of studying music as a kid has been the ability to jump right into public school music programs without having to learn the basics. You really get a lot farther when you start with a strong foundation. Both of us are planning to continue music throughout our last year of high school and one of the biggest things we look for in a potential college is whether or not they have a music program because we don’t want to leave that behind. The best thing about music is that you don’t have to do it professionally to have an appreciation and a passion for it. Who are some people that have supported you throughout this journey? Michelle: Our parents and grandparents have been some of our biggest supporters. They have been to every concert we’ve ever performed in. Our grandparents have been equally supportive and always inquire about what we are learning and when we will be performing next. Miss Mindy has been a huge support since day one and our current teacher Miss Jean has really helped us improve ourselves as musicians. The band directors at school have been awesome. Nicole: That support system is very important and it’s one of the best aspects of Little School of Music. They have the most dedicated and supportive staff. How has music helped to shape your life? 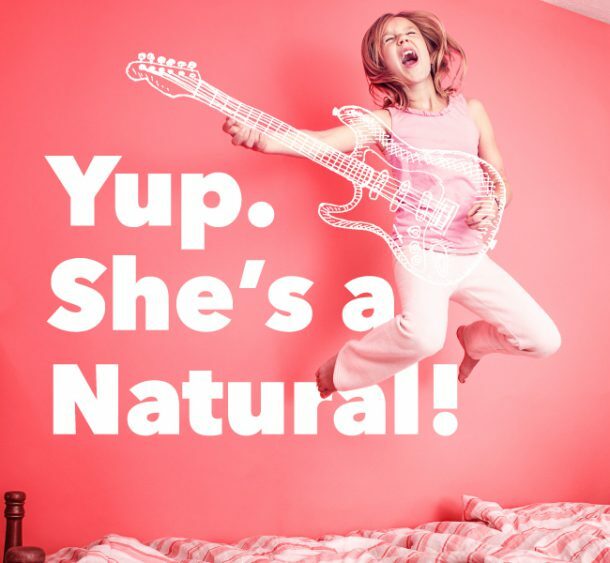 Nicole: A huge chunk of our lives revolve around music. When we hang out with friends we talk about band practice and anything music related. When I can’t focus on my math homework, I turn on music and I can focus better. It has made me more confident because I know that I’ve messed up in concert before and picked myself up to do even better. Michelle: These experiences have given me a big appreciation for music not only when playing but also when listening. I realize how lucky I am to be a part of something that has such rich history. There are so many people around the world who can communicate music in different ways and it’s incredible to be a part of it. Being able to play instruments allows you to be a member of that community; not just a listener. It teaches really valuable lessons such as responsibility, dedication, perseverance, honoring your commitments, leadership, and teamwork. Tell us about your most memorable experience growing up in the music program. Nicole: I think I can speak for us both for this. One of our favorite musical memories growing up was when we were in a small band at Little School of Music called the Strawberry Jam Band. We are still friends with all those same people today. The best part was that we practiced on Friday nights and in the springtime it got dark early. We were only in sixth grade so we felt really cool that we were playing music and it was dark outside. We would open up the windows and jam out. We felt like grown-ups or professional musicians. It was magical. What is your favorite Instrument and why? Michelle: My favorite instrument is the trumpet although I do not play it. It’s got such an emotional and beautiful sound and tone and so many styles. Nicole: Piano. There’s something different about piano because you can use both your hands to make two separate melodies and carry on two separate ideas at the same time. It’s challenging and wonderful to listen to. Share a musical accomplishment that you are most proud of. 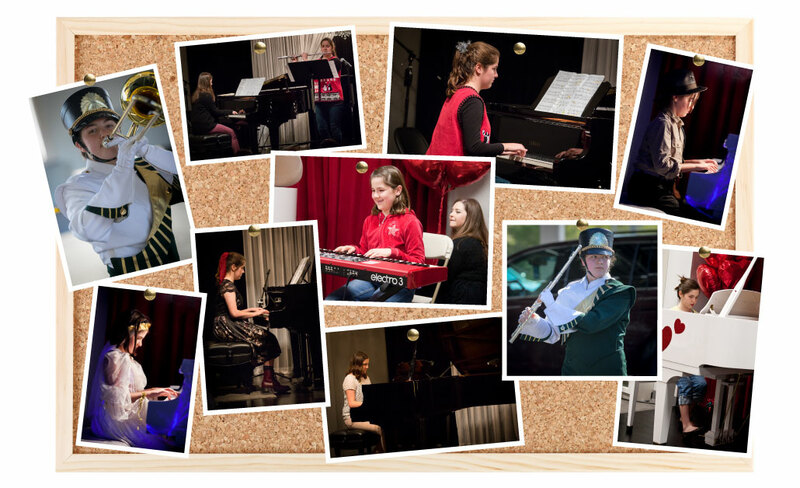 Michelle: I am proud to share my knowledge and help other people at school to learn their instruments. The most special thing about taking lessons for so long is sharing it with people who didn’t have access to those teachings. Nicole: My biggest accomplishment is that I am now learning a song from my Royal Conservatory of Music Level Ten book. That’s the highest I can go and I am extremely proud of that. Every time I open my book and see “Level Ten,” I freak out. What suggestions or encouragement can you offer other students that are thinking about starting a music program? Michelle: If one path isn’t working, don’t be afraid to try something new. If you don’t like an instrument, try a different one because your own motivation makes a huge difference. Sometimes an instrument isn’t right for you and you don’t like it as much as another. Also, I would like people to know that if you are able to, private lessons are 100% worth it. Having the extra helper and layer of support is so beneficial because you learn so much faster. I think it’s an easier, quicker and less stressful way to learn. Nicole and Michelle are planning a special solo Senior Recital this year before heading off to college. There is no doubt it will be a thoughtful, entertaining performance. From everyone at Little School of Music, we hope the twins’ final year in high school is the best of all, and full of memorable experiences and fun!